← A Summer BBQ. Grilled Chicken Skewers with an Asian Inspired Marinade. Pasticcio di Pasta Al Forno. Literal translation? From the Italian. Oven baked pasta pie. Known quite simply and affectionately as pasta bake in our house. There are many different variations of this delicious dish. Ingredients vary wildly depending upon regional traditions and approaches. Popular not only in Italy but across the Mediterranean. Italy has its pasticcio, Greece pastitsio and Malta its timpano. In Cyprus its called oven macaroni. And in Egypt macaroni béchamel. Oven baked pasta has a long history dating back to the Middle Ages and The Renaissance. Often served at banquets in the palaces of the nobility. A celebratory dish that allowed the chef an opportunity to show off creativity and inventiveness. Before too long its popularity spread to the masses. In many parts of Italy today it is still considered to be a festive dish and prepared on Sundays, religious holidays, and special occasions. The key components of a fabulous pasta bake? Tubular pasta of some description. Think penne, rigatoni and macaroni. Tossed through a rich, luscious meat sauce. Beef, pork, lamb,or veal works well. Blanketed by a creamy béchamel sauce. Sometimes enriched with egg. And perhaps cheese. And there lies the magic of the not so humble pasta bake. It’s infinitely versatile. Limited only by your imagination. Or perhaps the contents of your pantry or fridge. Here’s my latest interpretation. ADD onion, garlic and a good pinch of sea salt. Saute for 5 minutes or so until onion is soft and transparent. ADD tomato paste. Stir to combine and cook for a minute or so. INCREASE heat to high. Add lamb mince. Cook for 10 – 15 minutes until meat is well browned, stirring continuously with a wooden spoon to break up mince. ADD canned tomatoes, rosemary sprigs and cinnamon. Bring the sauce to the boil. REDUCE heat to low. Simmer for 30 minutes or until meat is very tender and sauce has thickened. REMOVE sauce from heat. Discard rosemary and cinnamon. Stir in parsley. Season generously with sea salt and freshly ground pepper. MELT butter in a large heavy-based saucepan over medium heat for 2 minutes until foaming. ADD flour and stir with a whisk for 1 minute or so until the mixture bubbles. REMOVE the pan from the heat and add 1/2 cup of milk at a time, whisking constantly between each addition to prevent lumps from forming. RETURN saucepan to the stove on a medium heat and stir with a wooden spoon until the sauce comes to the boil and thickens. TRANSFER béchamel sauce to a bowl. Whisk in egg yolks and the Parmesan cheese. Stir vigorously until well combined. SEASON with sea salt flakes, white pepper and a good grating of nutmeg. COOK pasta in a large saucepan of boiling, salted water until tender, according to packet directions. Drain. ADD pasta to meat sauce. Stir to combine. 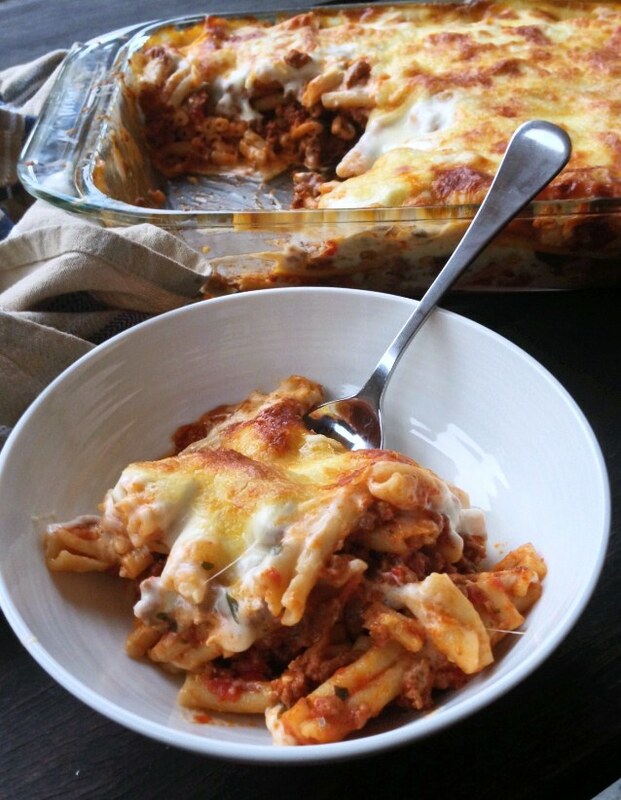 SPOON pasta and meat sauce into an 8 cup-capacity oven proof dish. TOP with a generous and even layer of bechamel sauce. BAKE for 30 minutes in a hot oven until golden and bubbling. 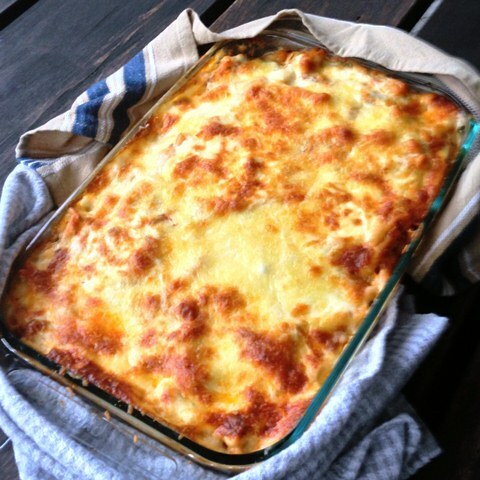 This entry was posted in Lamb, Pasta, What I Love to Cook and tagged Bechamel, Cheese, Food, Lamb, Pasta, Recipe, Sauce. Bookmark the permalink. 5 Responses to A Pasta Bake By Any Other Name. Pasticcio di Pasta Al Forno. They call it pastica in South America. Whatever name you call it, I love it! I think every country must have a version. It’s the ultimate comfort food.